Dark matter is a hypothetical form of matter that does not emit electromagnetic radiation. This property makes it hard even to prove its existence. The speed of dark matter particles is low, which is why they are retained by galaxies. They interact with each other and with the ordinary matter so weakly that only their gravity field can be sensed; otherwise, dark matter does not manifest itself in any way. Each galaxy is surrounded by a dark matter halo of much larger size and mass. Most cosmologists believe that dark matter particles have large mass, hence their speed is high. Yet, back in the 1980s, physicists realized that under special conditions, these particles may be produced in the early universe with almost zero speed, regardless of their mass. They might also be very light. As a consequence, the distances at which the quantum nature of these particles becomes apparent can be huge. Instead of the nanometer scales that are usually required to observe quantum phenomena in laboratories, the "quantum" scale for such particles may be comparable to the size of the central part of our galaxy. The researchers observed that the dark matter particles, if they are bosons with sufficiently small mass, may form a Bose-Einstein condensate in the small galaxy halos or in even smaller substructures due to their gravitational interactions. Such substructures include halos of dwarf galaxies—systems of several billion stars bound together by gravitational forces, and miniclusters—very small systems formed only by dark matter. The Bose-Einstein condensate is a state of quantum particles occupying the lowest energy level, having the smallest energy. A Bose-Einstein condensate can be produced in the lab at low temperatures from ordinary atoms. This state of matter exhibits unique properties, such as superfluidity, the ability to pass through tiny cracks or capillaries without friction. Light dark matter in the galaxy has low speed and high concentration. Under these conditions, it should eventually form a Bose-Einstein condensate. But in order for this to happen, dark matter particles must interact with each other—but as far as we know, they interact only gravitationally. "In our work, we simulated the motion of a quantum gas of light, gravitationally interacting dark matter particles. We started from a virialized state with maximal mixing, which is kind of opposite to the Bose-Einstein condensate. After a very long period, 100,000 times longer than the time needed for a particle to cross the simulation volume, the particles spontaneously formed a condensate, which immediately shaped itself into a spherical droplet, a Bose star, under the effect of gravity," said one of the authors, Dmitry Levkov, Ph.D. in Physics, senior researcher at the Institute for Nuclear Research of the Russian Academy of Sciences. Dr. Levkov and his colleagues, Alexander Panin and Igor Tkachov from the Institute for Nuclear Physics of the Russian Academy of Sciences, concluded that Bose-Einstein condensate may form in the centres of halos of dwarf galaxies in a time span shorter than the lifetime of the universe. This means that Bose stars could currently exist. The authors were the first who saw the formation of a Bose-Einstein condensate from light dark matter in computer simulations. In previous numerical studies, the condensate was already present in the initial state, and Bose stars arose from it. According to one hypothesis, the Bose condensate could have formed in the early universe long before the formation of galaxies or miniclusters, but reliable evidence for that is currently lacking. The authors demonstrated that the condensate is formed in the centres of small halos, and they plan to investigate condensation in the early universe in further studies. The scientists point out that the Bose stars may be the source of fast radio bursts that currently have no quantitative explanation. Light dark matter particles called "axions" interact with electromagnetic fields very weakly and can decay into radiophotons. This effect is vanishingly small, but inside the Bose star, it may be resonantly amplified, as in a laser, and could lead to giant radio bursts. 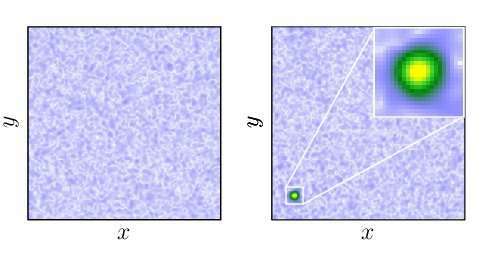 "The next obvious step is to predict the number of the Bose stars in the universe and calculate their mass in models with light dark matter," concluded Dmitry Levkov. A long and detailed article about, really nothing. It's all made up. No substance (pun intended). Science should go back to talking about real things. Where the pressure is great enough dark matter condenses into particles of ordinary matter. the "quantum" scale for such particles may be comparable to the size of the central part of our galaxy. Mind...blown. That is some freaky stuff to think about. This article is confusing, to put it mildly. How can a particle have "zero speed"? Isn't that contrary to to relativity? Aretino, if I understand it correctly this is an example of Quantum weirdness. Acceleration is always "Relative" to your point of view. It is unfortunate that popular meanings of words such as speed, temperature, condensation. etc? Have completely different meanings in Scientific Research or even between scientific disciplines. Which not only confuses the Public (Me Too!) but are abused by woo merchandisers who plagiarize scientific literature to scam the Public. Oh Bart! As for your hallucinations of what is real? And, hey! You look cute with that mistletoe crown and all painted in woad. Yes you do! Enter fredjose, stage sinister. With antlers glued to his head and a ridiculously over padded codpiece banging against his knobby knees! Interesting model, first one i've seen postulating that dark matter could be both WIMPs and MACHOs. It's also interesting insofar as an examination of how quantum mechanics might mix with general relativity on larger scales, rather than looking at how general relativity mixes with quantum mechanics at the smallest scales. If their mass is greater than ~5 solar masses, will a black hole form? Also, how many Bose star binaries might form? – initial model results seem to suggest that would be rare? – and would the gravitational wave signal from a merger of 2 Bose stars be different from that of other compact objects? – how about the merger of a Bose star with a neutron star? Or is the condensate not considered as compact (in which case a Bs-ns inspiral waveform would be quite unique)? It is "almost zero speed" and is measured in relation to the CMB as a frame of reference. Zero is not a relative quantity. If a particle has any speed (velocity? ), it can only be very small in reference to some particular reference, and from another reference, it will be appreciable. A particle with zero speed would be a fixed reference point, which we are told, can not exist. An easy way to see why that's not the case is by comparing the observed distributions of dark matter and normal matter. Dark matter is in clumps, filaments, and webs, with or without normal matter there to 'displace' it. It's not easy to visualize the 'geometrically curved spacetime' of general relativity, and sometimes looking at a 2-dimensional plane (rubber sheet analogy) can be helpful: mass/energy causes a dimple, not a hump – your proposed 'displacement' topology, i.e., the direction or orientation of the curvature's concavity, is the _opposite_ of general relativity. What is mistaken for clumps of dark matter is the state of displacement of the supersolid dark matter. What is mistaken for filaments of dark matter is the state of displacement of the supersolid dark matter. A caravan of submarines moving through a supersolid will displace the supersolid. Light lensing around the displaced supersolid will cause the caravan to appear to be in a filament. Dark matter is a hypothetical form of matter that does not hypothetically emit electromagnetic radiation. This property makes it hard even to prove its existence hypothetically. The hypothetical speed of dark matter particles is low, which is why they are hypothetically retained by galaxies. They hypothetically interact with each other and hypothetically with the ordinary matter so weakly that only their hypothetical gravity field can be sensed, as hypothetical dark matter does not manifest itself in any way. Each galaxy is surrounded by a hypothetical dark matter halo of much larger size and mass. Dark matter is believed to be not only "dark" (non-emissive) but actually transparent at all electromagnetic wavelengths, is that correct? I'm assuming you cannot observe that a clump of it is blocking the light from stars or galaxies. Sort of a Harry Potter invisibility cloak. Spooky. AP. The key it is to think in "set" mode. I like that they express "quantum" at a different scale. This story got me to thinking about Emergent Gravity again as a way to resolve the issues darkmatter. The question the article brings up in my mind, is if dark matter is gravitationally interacting then where are all the Dark Matter black holes? Correct. This is an article about a computer simulation. It can produce whatever the programmers want it to produce. ... It could have easily produced a star in the shape of a dodecahedron, or a bunny head with scary sharp teeth. The High Priests of the holy religion of Dark Matter stand resolutely at the altar where three scrolls are laid open - one saying Yes! and one saying No! and the third saying Maybe so! Depending on which direction the fumes from the incense holder blows, the High Priests determine, after much prayer and deliberation, which of the scrolls they will place their faith on that day. @howhot3 - first of all, what would differentiate a "dark matter" black hole from a regular one? There is certainly nothing that suggests that at least some dark matter wouldn't be swept up by and absorbed by black holes of any sort. At least I am unaware of any theoretical reasons why that wouldn't be the case. But the chances of a "pure" DM black hole are miniscule given that DM is almost always associated with regular matter. What got me thinking is what do they mean with slow speed? What exactly is confusing you so much? One sayeth Yes! One sayeth No! Third sayeth Maybe! Brownian cooling on gravitation, who would have thought it would not take forever? /s Strange, but possible. "Most cosmologists believe that dark matter particles have large mass, hence their speed is high." Maybe high in relation to speed at low temperatures of a Bose condensate, but AFAIU it is the high mass of CDM particles of a given momentum that gives them their relative low speed (or cosmologically "cold" temperature). This article seems confused on this point. When it describes how axions interact only weakly with gravity and this would more easily form these theoretic condensates, it seems more reasonable. Though then again, axions is not the simplest CDM. first one i've seen postulating that dark matter could be both WIMPs and MACHOs. I'm assuming you cannot observe that a clump of it is blocking the light from stars or galaxies. Though it would microlensing distort such light, so they would be detectable (if not distinguishable from black holes et cetera). Observations say it is not, and this article is based on that, so why troll something contradictory (and erroneous) without evidence? Religions are rejected by observation, dark matter is seen by many different observations. torbjorn_b_g_larsson> "Most cosmologists believe that dark matter particles have large mass, hence their speed is high." the days are over torbjorn_b_g_larsson, they are gone, begone to the quantum fluctuations torbjorn_b_g_larsson, as its yours and your choice only as it defeats the purpose and the obvious point, otherwise there is only one point, as in the singular numeracy of one. But the continueth path you'th taken leads only to what we have just left behind namely a singular numeracy of one. The question the article brings up in my mind, is if dark matter is gravitationally interacting then where are all the Dark Matter black holes? We can't tell them from the conventional matter ones. Considering we have no model for how intermediate mass black holes (that we have observed colliding via gravitational waves detection), they might be exactly that, dark matter black holes. well Ojorf, it looks as if you speak torbjorn_b_g_larsson mind, as though his mind is yours Ojorf, old boy. Because they also don't interact with photons they don't show up against the night sky as 'blocking starts', either. Ojorf> It is "almost zero speed" and is measured in relation to the CMB as a frame of reference. for this is your comment dear Ojorf, if you care to perpetuate the past, or the quantum flutuations in your stead old boy. for this is your comment dear Ojorf, if you care to perpetuate the past, or the quantum fluctuations in your stead old boy. in this spirit of glasnost Ojorf, it good to see ones quantum of thought on ones owns inky scribings old boy, as one does not get the chance quite often, as this is a rare insight into the mechanics ones other soul on their earthly scribings dear Ojorf, much appreciated, when in time has give a true and accurate quantum of fluctuation of your earthly soles worth, as now we know, it is worth the singular numeracy of one. where are all the Dark Matter black holes? There wouldn't be (m)any. If dark matter - as is posited - does not interact with itself then any 'mass' of dark matter that is attracted to any other such mass would just infinitely oscillate through their common center of gravity. It wouldn't 'clump' like regular matter. You *could* get a DM black hole if, by chance during such an oscillation, the local density would satisfy the Schwarzschild equation. But that is exceedingly unlikely. There might be some DM primordial black holes, though. But it's still not clear what the size distribution of primoridal black holes might be. If they are predominantly very small then they may have all evaporated due to Hawking radiation. "In our work, we simulated the motion of a quantum gas of light, gravitationally interacting dark matter particles. We started from a virialized state with maximal mixing, which is kind of opposite to the Bose-Einstein condensate. After a very long period, 100,000 times longer than the time needed for a particle to cross the simulation volume, the particles spontaneously formed a condensate, which immediately shaped itself into a spherical droplet, a Bose star, under the effect of gravity," said one of the authors, Dmitry Levkov, Ph.D. in Physics, senior researcher at the Institute for Nuclear Research of the Russian Academy of Sciences." ........and be there a need for anything more to be said? Everything is a modeled simulation from the bowels of some computer running algorithms designed to produce a selective outcome. I'd challenge these Cosmologists to take up the challenge to prove the Tooth Fairy is not a sister to the Cosmic Dust Fairy. Observations say it is. The supersolid dark matter displaced by the Earth, pushing back and exerting pressure toward the Earth, is gravity. Wave-particle duality is a moving particle and its associated wave in the supersolid dark matter. There is evidence of the supersolid dark matter every time a double-slit experiment is performed as it is the supersolid dark matter that waves. Dark matter fills 'empty' space and is displaced by ordinary matter. Particles of ordinary matter move through and displace the supersolid dark matter causing it to wave. Wave-particle duality is a moving particle and its associated wave in the supersolid dark matter. Ok, gravity wells not located where a black holes are found should produce a gravitational lens. This is a testable hypothesis. It depends on which religion is observed so as to be rejected, and by whom. Dogma/doctrine may be rejected, as well as all the trappings by which such religions are celebrated. But the basis of belief in religious thought is not ever lost or rejected by science, as it is virtually impossible to reject something in which science does not believe in the first place. That you have said that "dark matter is seen" is a complete falsehood. Science is committed to it not being "seen". Dark Matter is/has become a religion, predicated on a belief in seriously flawed observations, all of which could be caused by, or as a result of, some other action/reaction entirely different - that was previously unobserved (and possibly ignored) in the rush to uphold Dark Matter as the iconic and ubiquitous remains of Matter from the Big Bang theory, and through its own volition, has gone "underground" to avoid detection. Particles have Mass. Since Dark Matter is not directly observable and never can be, it isn't derived from any kind of Quantum Particle, therefore the fallacy of DM being "seen" through the process of microlensing/gravitational lensing renders the results of microlensing, etc. as also flawed science in that respect. I have no doubt whatsoever that science will bear this hypothesis out as true, if these scientists are, indeed, seeking Truth. They are birds of a feather. Most often, one or more of the members of the 5 Star Club will attach to a commenter who appears to believe wholeheartedly in the Spooky Meanderings of an invisible and undetectable (ghostly) woo out of the Dark Matter Faerie Tale. Perhaps they have also formed a quorum to create themselves a Dark Matter Club, to which such club members are also awarded the much-prized 5 rating to identify each one as a proponent of the holy orders. The ojorf (Mrs. Stumps) just like her husband, very seldom says anything sciency, but just like her husband - only insists on being given substantiated and credible evidence, herself believing in the UNSUBSTANTIATED and incredible evidence of Dark Matter (and Black Hole) mythology. Care for a hypothetical dark matter sandwich? This is called "microlensing" but it isn't visible outside our Milky Way galaxy because we don't have high enough resolution on any instrument we can build. But large areas where there is dark matter are indeed observed by gravitational lensing; these generally are associated with other galaxies in various ways, some of which are quite revealing. Look up the Bullet Cluster. As far as this article, I'm still trying to get my head around "Bose stars." Different name, same repetitive nonsensical blather.